I was born in Vienna, and trained in textiles for seven years, before studying for a Diploma in Art and Design, followed in 2006 by a BA (Hons) Fine Art degree. I am currently working towards an MA in Social Sculpture at Oxford Brookes University. I am an ideas-based maker, and I use the mediums that best express those ideas. 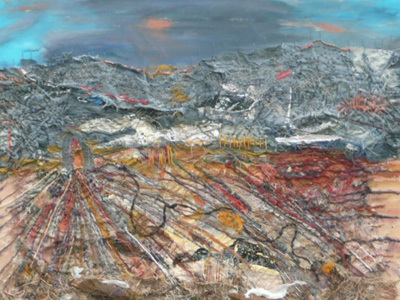 My materials are as diverse as stitch, cloth, paint, varnish, plaster, clay, glass, roofing felt, and wood. The final work may take the form of a sculpture, a video, a performance, or an installation. A recent work, In The Year 2424, shows an imagined garden of the future, when our natural world might have been replaced with artificial plastic organisms. The three works are woven with black bin bags, and the imagery is stickyback plastic (used to make nearly everything in Blue Peter programmes) super-imposed on the weavings. These could be viewed as the flowerbeds of the future but could equally double up as rugs for the home. The approach of the Social Sculpture MA course is that art can be used to address environmental and social issues. My most recent projects have focused on the clothing industry, the pollutive effect of its chemicals on rivers and the environment, and the impact of the trade in second-hand clothes on the ethnic identity of communities (previously expressed through clothing) and local textile industries. The work shown at The Oxfordshire Museum echoes my concerns about the environment. The Field highlights an insidious encroachment of human activity on nature. The fact that the work is drawn from the imagination is reflected in its completely artifical state. In constructing it I have partially returned to my textile roots as the medium which best expresses the subject matter.